January Funk Zone Art Walk! Join us this Friday night, January 10th to kick off the first Funk Zone Art Walk of 2014! 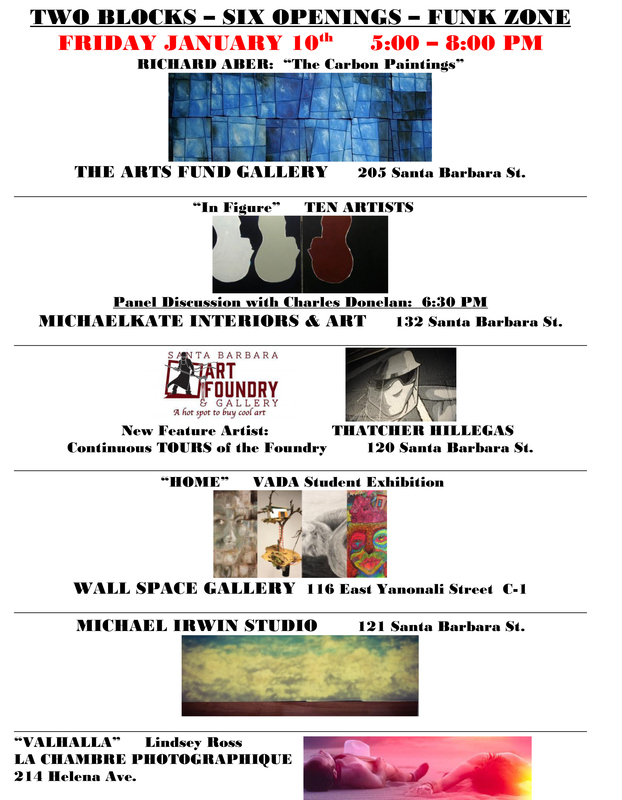 Yanonali Street is hopping Friday with new exhibitions at wall space gallery, Arts Fund, MichaelKate Interiors, Santa Barbara Art Foundry. Michael Irwin Studios and Le Chambre Photographique. At wall space gallery, a collaboration between Santa Barbara High School Visual Arts & Design Academy (VADA) and the gallery exploring the ideas of HOME. At Arts Fund, THE CARBON PAINTINGS by Richard Aber. This solo exhibition showcases his large-scale installation works and is curated by Kai Tepper. Richard Aber’s multi-panel wall works engage an explorative dialogue between modern industry and ecological preservation. IN FIGURE art exhibit at MichaelKate Interiors and Art Gallery, featuring 30 works of art. Panel discussion with the artists moderated by Charles Donelan at 6:30. Artists: Wayne Hoffman, John Carlander, Tara Patrick, Allan Gibbons, Isabelle Greene, Jan Ziegler, Brad Nack, Catherine Gee, Morris B. Squire, Larry Iwerks, Dustin Pappas, Karin Aggeler. At the Foundry, tours of the facility will continue through the night. Lindsey Ross’s Le Chambre Photographique presents a screening of “Vahalla” followed by a short comedy. First screening will begin at 7pm and the second screening will begin at 9pm. See you this Friday night! Join us between 5 – 8pm for a great night of art and conversation.